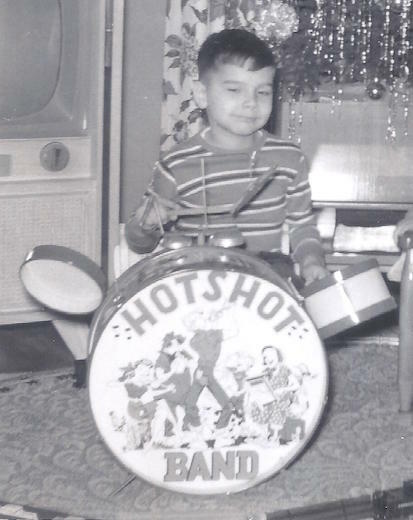 Sifting through a worn shoe box of old family photos many years ago, I spotted a black and white snapshot of five-year-old me playing with a toy drum kit in front of the Christmas tree. Placing it back in the box, I forgot about that old picture until recently when my sister located it following a brief volley of emails between us. She scanned and sent it to me, confirming my memory. Drumsticks in hand, my arms are poised to pound on those skins like a ham-fisted carpenter ready to drive nails into a two-by-four. Not an unwelcome surprise, my sister was in the photo too, sitting in her tiny rocking chair, cradling a life-size baby doll in her arms. Why didn’t I remember that? Rather than obsess, I cropped her out of the shot to more closely match my memory of the event. Don’t worry. She still has the original print. I don’t know what ever became of the drums or the rocking chair, but my sister is fine and I never grew up to be the next Gene Krupa. Author with drums. No sister. As a kid born of first generation American-Italians, it was only a matter of time before picking up a real musical instrument would become reality. A search for just the right one began in grade school. It might have been a Harold Hill-type salesman from the local music store, dropping high-pressure buzzwords like “woodwind” and “embouchure” and “Stan Getz.” Or perhaps it was the sweeping shape of the instrument itself, brass keys gleaming in the sunlit storefront window, beckoning like a siren singing to Odysseus. Whatever the circumstances, a slightly tarnished, used alto saxophone was selected and brought home. A small tag which carried a handwritten rental number was secured by white string to the handle of its carrying case. Accompanying the instrument were private lessons at the music store and group lessons at my grade school. Group lessons evolved into the formation of a small combo which, for all intents and purposes, was called a band. It was comprised of one or two clarinets, a cornet, a flute and my saxophone. The instrument also was accompanied by the requirement of regular practice to make its rental worth the monthly cost. Apparently, I did well enough over time to earn a saxophone of my own, compliments of Mom and Dad. To show my appreciation I practiced faithfully and learned a handful of songs. Know it or not, you’re probably familiar with Alexander Borodin’s musical composition, Gliding Dance of the Maidens. Specifically, it’s the second piece from a long set of eight Polovtsian Dances in Borodin’s even longer but never finished opera, Prince Igor. Few people recognize it by any of those names. The sheet music I rehearsed was indeed titled Gliding Dance of the Maidens. But underneath that bold print, a small parenthesized subtitle indicated it not only was the Theme from Prince Igor, but a popular song, Stranger in Paradise, from the 1953 Broadway musical, Kismet. Like much of the music in Kismet, its melody was borrowed from Borodin. The first band recital for our classmates was presented via the magic of technology. Our ensemble was huddled in the rear part of an all-purpose room, surrounded by painted concrete block walls. It’s my educated guess the nuns weren’t thrilled about herding three hundred or so crumb grabbers through the hallway and into such a cramped space, so a microphone connected to the school’s PA system stood in front of us. At the appointed time we played America the Beautiful, perhaps a Sousa march, and then a couple of solo pieces. Emanating from wall-mounted classroom speakers, my Borodin/Kismet solo caused at least one girl from my eighth grade class to swoon. That was the rumor, verified the following day by the girl herself, blushing cheeks and all. In theater, a wonderful dress rehearsal can sometimes lead to a disastrous opening night. The same might be true for eighth grade recitals. That in-house broadcast led to a citywide, evening recital in the Lincoln Junior High School auditorium. In attendance were my family, my aunt and several hundred strangers. Though I’d rehearsed a couple of times with piano accompaniment from my teacher, the accompanist tonight would be someone whom I’d never met. Her rhythm and timing resulted in us both rushing through Borodin’s composition at a tempo more suited for circus calliope than for alto sax. Worse, a new mouthpiece reed stiffening against my tongue made some previously sweet notes sound like a goose honking overhead. Polite applause greeted the song’s coda. Now the only blushing cheeks were mine. With summer approaching, beyond which freshman year of high school awaited, I quietly gave up practicing the alto sax. Turning my musical attention to a recently gifted electric guitar, I chose the Beatles over Borodin. The saxophone and I soon became strangers and the paradise of rock ‘n’ roll glowed brightly on the horizon, inviting me to enter its glittering gates.